Blackjack is a banking casino game widely played in the USA. Lately, it’s gaining popularity among other countries of the world. It is also referred to as ‘twenty one’. In contrast to other games, the player competes against the banker (dealer). The player aims to obtain a hand with total points closer to 21 compared to the hand of the banker. The points should however not be more than 21. It is so far the most popular banking casino game in the world. Here is a look then at the blackjack rules and variations that combine to make sure the game is always evergreen. 52 standard card decks are used to play this game. Each denomination is assigned a value. Cards numbered 2 all through 10 have their worth as the face value on each card. Queens, jacks and kings have their worth as 10. However aces are either worth 1 or 11(depending on the player’s choice). The player aims at drawing cards whose total value is close to 21 compared to the banker’s card. Whoever obtains the best total of the two (two card 21) is the winner. Nevertheless, if it happens that the dealer too archived a two card 21, this is a tie and the player receive back their original bet. However, if the banker proceeds to draw 21 in either 3 or more cards, the blackjack of the player wins by a 3-2 payoff. 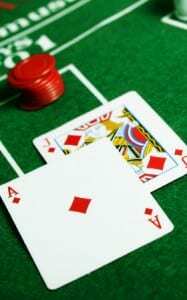 Blackjack is played at a table usually arc shaped. The table can accommodate at most seven players who stay outside while the dealer stays inside. A rectangular shaped placard displays the betting amount both minimum and maximum on each table. Normally the maximum bet is 10- 20 times the minimum. The cards are then shuffled and then placed in a decks commonly referred to as a shoe. The dealer slides one card from the shoe at a time. Play commences when the first player places a bet usually by stacking chips on the table. Other players follow suit and place their bets as well. The dealer and the players are then each issued with two cards. All the cards of the players are dealt face up. The dealer’s card is also turned face up for the players to see. The players then decide how they’ll play their hands. The dealer then draws extra cards to a total less than 16. He must however stop at any total, which is either 17 or more. If a player hits, he takes extra card(s) aiming at getting much closer to 21. Unfortunately, if his total is more than 21, the player loses the bet. Hope you have a wonderful experience playing blackjack. Be sure to hit 21!